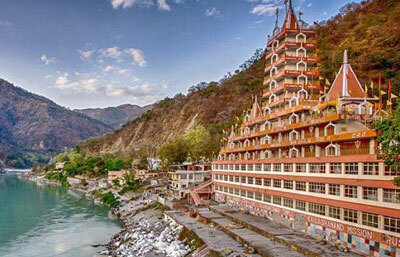 Located on the banks of the River Ganga, Rishikesh is a sacred city on the foothill of the Himalayas. This destination in Northern India appeals a large number of tourists from all across the world. Rishikesh has been a magnet for spiritual seekers who have deemed it as the ‘Yoga capital of the world’. The entire city is full of ashrams with various types of yoga and meditation classes. A Rishikesh Tourism includes visit to a land enveloped by forested hills where Yoga provides a perfect panacea. Travel to Rishikesh to soothe and relax your exhausted mind. Restless adventurers can choose from a range of river rafting, trekking, cliff jumping, camping, rappelling, kayaking and a plethora of such options. Rishikesh finds its mention in the Holy Hindu Epic Ramayana. This is the place where Lord Rama penanced after killing Ravana; who was a Brahmin. Laxman, Lord Rama's younger brother crossed the Ganga here from a Jute Rope. This is the reason the Suspension Bridge here was named after him and called Laxman Jhula. This is a hanging bridge, which has been a popular attraction amongst the tourists visiting Rishikesh. Built in 1929, the suspension iron bridge Lakshman Jhula is believed to be the place where Rama's brother Lakshman crossed the river on a jute rope. Tourists can enjoy the breathtaking surroundings while standing on the bridge. Just near the Triveni Ghat, Rishikund is an ancient place related to Kubz Saint. He was blessed by the Goddess Yamuna by infusing this pond by its water. The temple of Raghunath, dedicated to Lord Rama and his wife Sita is largely visited by devotees for various religious ceremonies. Ganga arti in the Triveni Ghat is a sight to behold. It is a multi-story temple whose complex houses the idols of Hindu Gods and Goddesses. Visitors can watch a beautiful view of the whole area, from the top floor of the temple complex. Sunrise and sunsets from this point are absolutely spectacular. Located in the heart of the old town and on the banks of the Ganges, Bharat Mandir was built in 12th century by Adiguru Shankracharya. The inner sanctum of the temple houses the idol of Lord Vishnu that has been carved out of single Shaligram. The temple finds a mention Vishnu Puran, Shrimad Bhagwat, Mahabharat, Vaman Puran and Narsingh Puran. Devotees flock here during Akshaya Tritiya to do 108 times Parikrama (circumambulation). It is amongst the oldest temple complexes in the area. The holy Indian epic Ramayana and Mahabharata are illustrated on the walls. This suspended bridge is close to Lakshman Jhula. It was recently constructed between Shivanand Ashram and Sawarg Ashram. Also known as Shivanand Jhula, it is similar to the Lakshman Jhula. The land of Holy Ganga is also a heaven for adventure lovers. This living Mother Goddess Ganga offers the best of Rafting options one can ever experience. 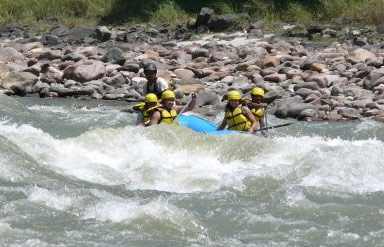 Brahmpuri, Shivpuri, Marine Drive and Kaudiyala are best spots for White River Rafting. Other adventure sports that can be considered are camping, hiking, bungee jumping, trekking, rock climbing, giant swing, cliff jumping and backpacking. Rishikesh also offers Asia's longest - 1 km long Flying Fox. Rishikesh has a plenty of accommodation options, ranging from Five Star luxury hotels to budget as well as other lower budget options like Dharamshala etc. August-October are the best months for a refreshing holy dip in the Ganges. River rafting enthusiasts can plan a visit between September - October till mid November. Early March, April till May are also favourable for adventure sports. July – the month of Savan or monsoons draw a lot of crowd in the Lord Shiva temples. By Air: Dehradun, Jolly Grant Airport is at 35 km from Haridwar. From here, you can take a bus or taxi to reach the city. By Rail: A slow shuttle train between Haridwar and Rishikesh connects it with major cities of India. These include Delhi, Mumbai, Kolkata, Lucknow, Varanasi, Dehradun and many others. 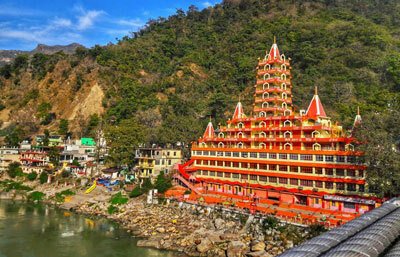 You can get to Haridwar by Dehradun Shatabdi and then, hire a taxi or bus to Rishikesh. By Road: You can go by bus or hire private vehicles like cars and coaches to reach Rishikesh. Cities like Haridwar, Dehradun and New Delhi are covered frequently by everyday buses.